Henrikh Mkhitaryan is an Armenian football midfielder, who currently plays for Ukrainian Premier League club Shakhtar Donetsk. He is a member of the Armenian national team, participated in 33 international matches and scored 8 goals since his debut in an away friendly match against Panama on 14 January 2007. 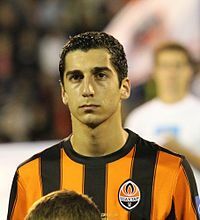 Mkhitaryan joined the Pyunik FC youth system in 1995 and was later promoted to the first team of Pyunik FC, making his professional debut in 2006 at the age of 17. Due to his success in the Armenian Premier League 2009 at Pyunik Yerevan, he joined Ukrainian Premier League club Metalurh Donetsk. He scored a goal on his debut in a 3–0 victory against Belarusian Premier League side FC Partizan Minsk, in the Europa League on 16 July 2009. He finished the season with 14 goals in 38 appearances, including 29 league matches and 9 goals. The following season he was named captain of the club on 14 July, at the age 21, making him the youngest captain in Metalurh Donetsk history. During the season 2010–11 Mkhitaryan was bought for $7.5 million by the champions Shakhtar Donetsk. His first season with the club was extremely successful for Shakhtar as they won the treble (Premier League, Ukrainian Cup and the Super Cup). In the 2011–12 season Shakhtar won the Premier League and the Ukrainian Cup. Mkhitaryan is one of the most important members of the Armenia national team. As of 14 November 2012, Mkhitaryan is the second top goalscorer of all time with 10 goals, after Arthur Petrosyan who has 11 goals in 70 matches.